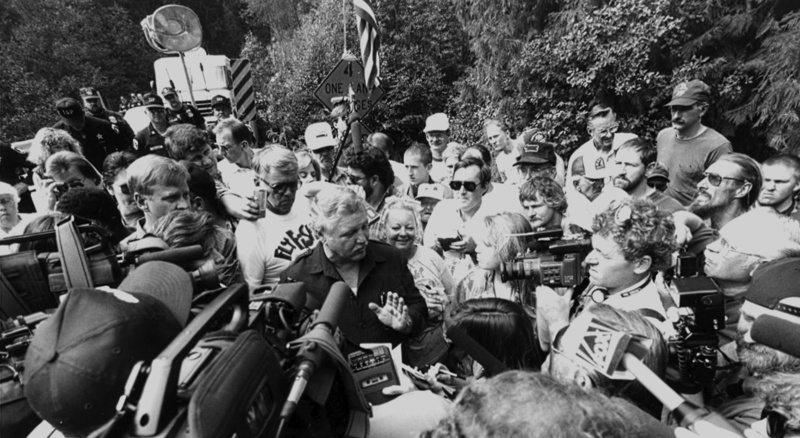 The 11-day siege known as Ruby Ridge became a bookmark in the lives of two Spokane journalists who covered the event before their careers moved in other directions. “I remember going to the Bonners Ferry airport the morning of the second day, as military helicopters and what appeared to be armored personnel carriers were deploying from the airstrip,” recalled former KXLY-TV reporter John Allison, who’s now a Spokane attorney. The almost war-like scenes that unfolded in the scenic mountains of Boundary County, Idaho – with protesters and the media kept behind a roadblock a few miles from the cabin of fugitive Randy Weaver – also is etched in the memory of Jess Walter. Then a reporter for The Spokesman-Review, Walter went on to write the definitive book on Ruby Ridge, one that later was turned into a made-for-television movie. “I think Ruby Ridge’s significance, like so much in our culture now, depends on which end of the kaleidoscope you’re viewing it from,” said Walter, who has become a best-selling author. “Ruby Ridge is seen by many people as the most outrageous example of ‘government-out-of-control’ – a family’s rights and lives taken away because of overreaching law enforcement, a slew of mistakes, and an ensuing cover-up,” Walter said. But Ruby Ridge also must be remembered in part as a civil rights case, Walter said. The U.S. had seen the Rodney King riots in Los Angeles. “But this was different,” the former reporter said. “I had read and heard about government dissidents sprinkled around North Idaho and western Montana. Ruby Ridge crystallized this movement and caused the rest of us to understand the seriousness of their resolve. “As the days progressed at the roadblock, we watched as a single disillusioned man and his family on a mountaintop drew more and more supporters from afar who looked more mainstream, and much angrier, than we might earlier have predicted,” Allison said. “I can’t necessarily see a direct line from Ruby Ridge to the tea party, but there are probably a few common threads within the fabric of today’s political discourse,” Allison said. Reporters who covered the event didn’t have Internet access via cellphones. In fact, only a few early-era cellphones were around then, and there was no cell coverage at the roadblock. The Spokesman-Review paid to have a telephone line installed at a nearby barn-turned-barracks where its journalists filed stories. “The American news media, like America in general, is very different today than 20 years ago,” Allison noted. “The national media, particularly cable TV and AM talk radio, now not only feeds off of these kinds of controversies, but also stoke them,” he said. “How would the opposing forces at Fox News and MSNBC, or maybe Nancy Grace, handle this story if it broke out tomorrow?” Allison asked. Walter recalled that Ruby Ridge occurred at the end of a period in which the Northwest, and North Idaho especially, was rife with white separatist and supremacist groups. Federal law enforcement had “a blind desire to infiltrate those groups,” he said. As the years have peeled by, Walter said he hoped that Ruby Ridge “was like the final act in a small war that was waged right around us.” But then in January 2011, a racial extremist planted a pipe bomb on the route of the Martin Luther King Jr. Unity March in downtown Spokane. “I think we’d all imagined that that chapter was over in the Northwest,” he said.